I honestly don't remember starting this thread. I was probably tore up. Don't drink and GRB kids. The 20-year-old switch-hitter went deep from the right side of the plate against a rehabbing Clayton Kershaw before finishing 1-for-3. Carlson has tallied at least one hit and one RBI in five of his first six games for the Cardinals. Carlson also went deep against Kershaw. The Memphis Redbirds (2-5) came back from a 5-3 deficit in the ninth inning Wednesday night in San Antonio, Texas, but Mauricio Dubon walked off for the second-straight game to give the San Antonio Missions (Brewers) a 6-5 victory. After Memphis scored twice in the top of the ninth to tie the game at 5, San Antonio (5-2) got the game-winning single from Dubon with one out in the bottom of the ninth. He also had the game-winning single against Memphis last night. Jake Woodford allowed just one unearned run on one hit in 5.0 innings of work, which was the second-straight start he gave up one unearned run in 5.0 frames on the hill. He has now allowed just three hits in 10.0 innings this season, and he has 11 punch-outs to his name. But after Woodford left with a 2-1 lead in the sixth, San Antonio scored three times in the home-half of the inning off Genesis Cabrera. 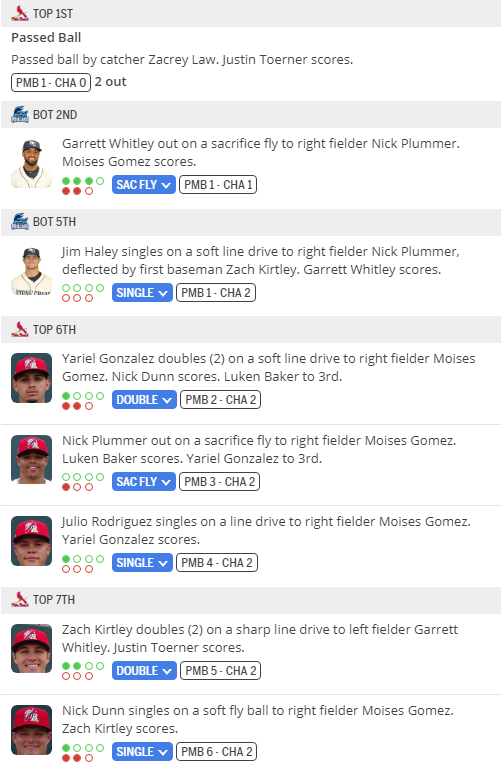 The Redbirds did get one back in the top of the seventh when John Nogowski hit his first home run of the season and first as a Triple-A player, but the one-run deficit did not remain long as the Missions' Keston Hiura touched Cabrera for a long ball in the eighth. The Redbirds battled to tie the game in the ninth on a bases-loaded walk to Nogowski and an Edman sacrifice fly, but San Antonio wrapped things up a half-inning later against Chris Beck. Six different Redbirds had a hit on the night, and Edman and Nogowski both finished with two RBI. Memphis struck out eight times as a team, was 1-for-8 with runners in scoring position, and left seven men on base. The Tulsa Drillers (4-3) completed the three-game sweep of the Springfield Cardinals (0-7) with a 12-6 win at ONEOK Field on Wednesday afternoon. -LF Conner Capel got the Cardinals an early lead with an RBI single in the top of the first, but the Drillers rattled off four runs in the bottom of the first to take a 4-1 lead. -Tulsa scored in each of the first five frames to stretch the lead to 12-4. -SS Kramer Robertson provided late runs with an RBI single in sixth and a solo shot in the ninth, but Tulsa closed it out from there for the 12-6 win. -CF Dylan Carlson extended his five-game hitting and RBI streak with a base hit and an RBI sacrifice fly, driving in his team-leading eighth RBI. -SS Kramer Robertson's homer in the ninth marked the second straight game with a long-ball for the shortstop, as he and Carlson both took rehabbing Dodgers LHP Clayton Kershaw yard on Tuesday night. Robertson finished Wednesday's game 3x4 with the homer, two RBIs and two runs. -2B Irving Lopez went 2x5 with his first-career Double-A homer, a solo shot in the third, and a double. After trailing by as many as five runs, Palm Beach had the tying run in scoring position in the ninth inning but were unable to complete the comeback in a 5-3 loss to Daytona. The teams were scorless heading into the third inning until Daytona scored three runs against Palm Beach starter Edgar Gonzalez. The 22-year-old threw just 2 2/3 innings, allowing those three runs and striking out one. Daytona's lead grew to five when the visitors plated two more runs in the fifth off Zach Prendergast. 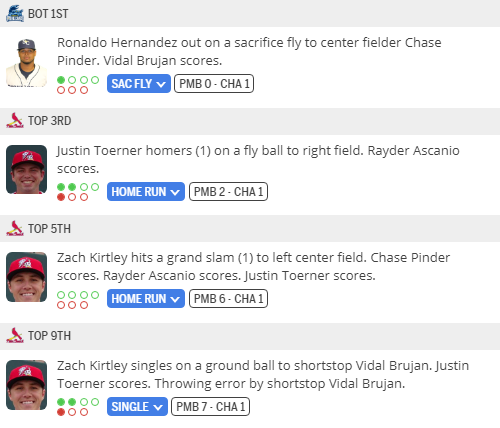 The Cardinals got on the board in the bottom half of that inning when Luken Baker's two-out single brought in Justin Toerner. Right behind him was Yariel Gonzalez who got thrown out at home after a gorgeous throw from the outfield. Daytona was in prime position to score extra insurance runs with the bases loaded and no outs in the seventh, but Patrick Dayton pitched himself out of the jam and kept Daytona off the scoreboard. In the eighth, Bryce Denton hit a two-out RBI single that scored Baker and brought Nick Plummer to third, however the throw home was cut off and Denton was thrown out at second base trying to advance, ending the threat and the inning. Palm Beach showed signs of life in the ninth, scoring a run and bringing Nick Dunn to the plate with runners on second and third base down two runs. The left-handed hitter hit a two-strike pop up to the shortstop ending the last effort and the game. Justin Toener walked twice and Yariel Gonzalez had three hits in the loss. Out of the bullpen, Patrick Dayton tossed two scoreless innings followed by Junior Fernandez's scoreless ninth. The Peoria Chiefs got another outstanding starting pitching effort on Wednesday and beat the Wisconsin Timber Rattlers 4-2 for their first winning streak of the 2019 season. The Chiefs are now 3-4 on the season with one game left on the homestand. The Chiefs jumped out to an early lead against lefty Wilfred Salaman in the first inning. Brandon Riley and Josh Shaw started the inning with singles and Brady Whalen's single loaded the bases with one out. Leandro Cedeno put the Chiefs on top 2-0 with a single to left field before Salaman got out of the inning. Alvaro Seijas cruised through six innings as he bounced back from Friday's loss in Cedar Rapids. He allowed just four hits, three singles and a double while striking out six. Wisconsin didn't score until the eighth inning when they tallied against reliever Noel De Jesus. The Timber Rattlers got a pinch-hit RBI single from David Fry against Fabian Blanco in the ninth and had the tying run on base with one out. Edgar Escobar came out of the bullpen and got Antonio Pinero to hit into a game-ending double play. Last edited by CardsofSTL on April 10 19, 10:04 pm, edited 1 time in total. Vladimir Guerrero Jr. is heading to Triple-A Buffalo, a source told MLB.com’s Jesse Sanchez. The 20-year-old phenom, who is MLB Pipeline’s No. 1 overall prospect, opened the season with Class A Advanced Dunedin after suffering a left oblique strain during Spring Training. In four games with Dunedin, Guerrero went 4-for-15 with a double and a walk. Triple-A Buffalo is expected to be Guerrero’s final stop before he makes his Major League debut. Blue Jays president Mark Shapiro said in late March that Guerrero would be on an "accelerated" path to the Majors once he returned to health. Guerrero experienced Triple-A competition for the first time in 2018 and hit .336/.414/.564 with six homers in 30 games. His return to Buffalo’s lineup will have to wait, however, as the team’s scheduled game on Wednesday was postponed due to cold weather. The Memphis Redbirds (3-5) got sparkling relief work from four pitchers Thursday night in San Antonio, Texas, and the club plated three runs in the decisive seventh inning to capture a 6-3 win over the San Antonio Missions (Brewers) in the series finale. Tommy Layne, Alex Reyes, John Fasola, and Chasen Shreve retired 18 of 20 Missions (5-3) from the fourth inning onward, with the only two batters reaching on a walk and an error. They followed Ryan Helsley, who allowed three runs on six hits in 3.0 innings of work to start the game. On the offensive side, Tommy Edman was 3-for-5 with two runs scored for his fourth multi-hit game in seven contests this season. Rangel Ravelo drove in three runs, and Edmundo Sosa was 2-for-4 with a home run. After scoring twice in the first inning, San Antonio plated three runs in the bottom of the second to take a 3-2 lead. The Redbirds tied it up in the next half-inning, and the contest remained knotted at 3 until the top of the seventh. Sosa led off with his first long ball of the season, Max Schrock followed with a walk, and Edman doubled through the hole at second base before Ravelo stepped to the dish after a strikeout. He promptly doubled to clear the bases and provide the Redbirds some breathing room. Fasola then entered with a 6-3 lead behind him, and he quickly struck out the side in the seventh. He also fired a scoreless eighth, before Shreve took the ninth inning and picked up his first save of the year after a flyout and two punch-outs. San Antonio starter Zack Brown pitched 6.0 innings and gave up three runs on seven hits with five strikeouts. Redbirds pitching whiffled 12 in the ballgame. -2B Irving Lopez crushed a walk-off two-run home run in the bottom of the ninth for the 12-11 final. -Jose Godoy drew Springfield within 11-10 when his fly out to center in the ninth inning led to Scott Hurst scoring. -Northwest Arkansas scored a pair of runs in the top of the ninth, marking the second time in the game the Naturals battled back and took the lead from three or more runs down. -CF Dylan Carlson extended his hitting streak to six games with a 2-for-4 night. -SS Kramer Robertson's two-run homer in the fifth marked the third straight game with a long-ball for the shortstop and put the Cardinals ahead 6-5. Robertson finished Wednesday's game 2-for-3 with four runs and is 6-for-10 with six runs and seven RBIs in his last three games. -2B Irving Lopez has now homered in back-to-back games following his walk-off shot. - Six different Cardinals posted multi-hit nights, including Lopez (2-for-4), Conner Capel (3-for-4), Elehuris Montero (2-for-5), Robertson and Jose Godoy (2-for-5). After suffering just their second loss of the season on Wednesday, Palm Beach rebounded with a shutout 6-0 victory over the visitng Daytona Tortugas in the series finale. The Cardinals took three of the four games and improve to 6-2 on the young season. The Beach Birds got on the board in the second inning when Jose Martinez's double play ground ball brought home Bryce Denton. That's all the run support starter Alex Fagalde would need as the 24-year-old tossed five shutout innings, earning his first victory of the season. The Cardinals batted around in the sixth inning, plating five runs and extending the lead to 6-0. Zach Kirtley walked with the bases loaded and was followed by Nick Dunn's two RBI single to left field. Luken Baker then hit an opposite field ground-rule double that brought home both Kirtley and Dunn. C.J. Saylor (2 IP), Kodi Whitley (1 IP), and Junior Fernandez (1 IP) kept the Tortugas off the board with scorless outings from the bullpen. The Memphis Redbirds (3-6) led 2-1 after a Joe Hudson home run in the top of the eighth inning Friday night in Round Rock, Texas, but the Round Rock Express (Astros) scored three times in the home-half to capture a 4-2 victory in the series opener. The Redbirds had four hits in the game and were hampered by 12 strikeouts, two errors, and six walks by their pitching staff. Round Rock (6-3) banged out 10 hits but left 11 runners on base as Memphis escaped multiple innings with no damage done. Daniel Ponce de Leon turned in a solid start on the mound, working 5.2 innings with just one unearned run. He scattered seven hits and tossed 57 of his 97 pitches for strikes. The only run he allowed came in the first inning, with Myles Straw reaching on an error and later coming around to score. Memphis got on the board in the top of the sixth inning as Rangel Ravelo doubled in Drew Robinson, who walked. The game remained tied at 1 until the eighth, when Hudson bombed a one-out home run to left-center field. In the bottom of the eighth, Ryan Meisinger struck out the first batter of the inning before a single and a walk put two runners on. He induced a ground ball that led to a force out at second, but Memphis' second error of the night allowed the tying run to cross the plate on the play. Tommy Layne then entered the game and surrendered a two-run home run to Derek Fisher to make the score 4-2. Memphis went down in order in the top of the ninth to end the game, including two hitters set down on strikes. On the defensive end, Adolis Garcia had an outfield assist to erase a potential Round Rock runner at the plate. - CF Dylan Carlson drove home the game-winning run in the eighth inning on a groundball to short that scored Scott Hurst and Jose Godoy, with Godoy crossing on a throwing error that put the Cardinals up 9-7. - Godoy drew the Cardinals even at 7-7 earlier in the eighth when his infield single to Naturals pitcher Terrero ended with a throwing error that allowed Elehuris Montero to score. - Northwest Arkansas forced Springfield's eighth-inning comeback after turning a 6-3 deficit into a 7-6 lead in the top half of that inning, tying the game on Emmanuel Rivera's RBI triple and going ahead on a Meibrys Viloria single. - Carlson extended his hitting streak to seven games with a 2-for-5 night that included a 7th-inning triple to the wall in right. Carlson has seven extra-base hits in just nine career Double-A games. - Montero hit his first Double-A home run with a two-run shot to left in the fourth. - Four different Cardinals posted multi-hit nights, including Evan Mendoza (2-for-4), Brian O'Keefe (2-for-4), Elehuris Montero (2-for-5) and Jose Godoy (2-for-5). - The Cardinals have scored 23 runs on 26 hits in the first two games of this season-opening homestand, and Cardinals pitchers have struck out 21 Naturals over the stretch. - St. Louis Cardinals RHP Luke Gregerson pitched a scoreless fourth inning on Day 1 of his rehab assignment in Springfield, striking out two. Gregerson has now pitched 20.0 consecutive scoreless innings in a Springfield Cardinals uniform dating back to his final nine outings of the 2008 season. The Peoria Chiefs played a sloppy game in cold weather and fell to the Kane County Cougars 12-2 Friday night in the opener of a three-game series. The Chiefs committed a season-worst five errors and drop to 3-5 on the season with a doubleheader scheduled for 1:00 p.m. Saturday. Peoria left two runners on base against Cougars starter Franklyn Soriano in the first inning before the Cougars got on the board in the bottom of the frame. Tra Holmes was hit by a pitch from Chiefs starter Jacob Schlesener to start the frame. Geraldo Perdomo grounded out to third base but Holmes scored all the way from first when Leandro Cedeno's throw back to third sailed into the stands. Eduardo Diaz put the hosts on top 2-0 with a home run off the video board and the next three Cougars reached on two walks and a single to load the bases. Schlesener stuck out Alex King but an error by Nolan Goman plated Andy Yerzy for a 3-0 Kane County lead. After throwing his 35th pitch of the frame, Schlesener gave way to Franyel Casadilla mid at-bat and the new hurler struck out David Garza on the next pitch to end the frame. Down 5-0, the Chiefs got on the board in the sixth inning against reliever Ehtan Larrison. Brendaon Donovan greeted the right-hander with a double to right and Gorman launched his third home run of the season to get the Chiefs on the board. Gorman's 2-run shot bounced off the picnic tables in the right-field party area and back onto the field to cut the Cougars lead to 5-2. Kane County batted around again in the sixth against Freddy Pacheco as they tallied five times. A bases loaded double by Alex King plated three for a 10-2 Cougars lead. The hosts added on in the seventh as Wadye Ynfante dropped a fly ball and Zac Almond delivered a RBI double. They tallied the final run in the eighth against reliever Chris Hunt with a sacrifice fly from Holmes for the 12-2 win. Schlesener (0-2) took the loss as he allowed three runs, two earned, on two hits, two walks and a hit batter while striking out one in 2/3 of an inning. Casadilla allowed two runs on four hits over 4 1/3 innings while walking two, hitting one and striking out four. Pacheco lasted just 1/3 of an inning as he allowed five runs on two hits, three walks, one hit batter and he struck out one. Hunt allowed two runs, one earned, on four hits over 2 2/3 innings as he struck out four and hit two batters. The Memphis Redbirds (4-6) exploded for eight runs in the fifth inning en route to a 9-4 win over the Round Rock Express (Astros) Saturday night in Round Rock, Texas.